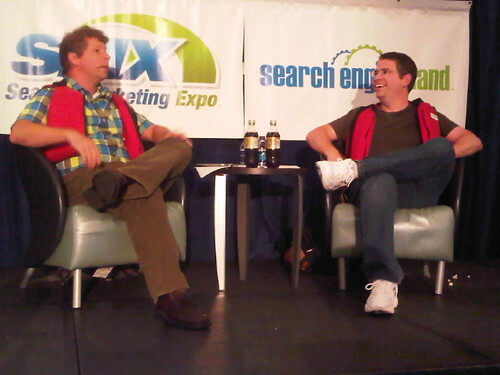 At SMX Advanced Seattle, Bruce Clay, Inc. and the team of guest livebloggers reported the information and research shared at 14 sessions. Topics and tactics ranged from SEO and social media to paid search and business considerations, presented by Internet marketing professionals and search engine representatives. Here you'll find selected highlights from each of the 14 sessions. 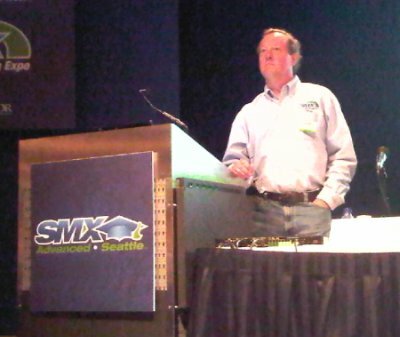 You can find in-depth conference coverage in the SMX Advanced liveblog posts on the Bruce Clay, Inc. blog. Google's new Web indexing system, Caffeine, is fully live. The new indexing infrastructure translates to an index that is 50 percent fresher, has more storage capacity and can recognize more connections of information. The Mayday update was an algorithm update implemented at the beginning of May that is intended to filter out low-quality search results. A new report in the Crawl errors section of Google Webmaster Tools indicates "soft 404" errors in order to help webmasters recognize and resolve these errors. Bing is opening up new ways to interact with maps. The newly released Bing Map App SDK allows developers to create their own applications which can be used to overlay information on maps. Bing Social integrates to Facebook firehose and Twitter results into a social search vertical. Bing plans to have the final stages of the Yahoo! organic and paid search integration completed by the end of 2010. Decisions about how to maintain or integrate Yahoo! Site Explorer have not been finalized. Bing's Webmaster Tools are about to undergo a major update. Refer to the Bing Webmaster Tools session for more on this development. Similarities between the two search engines: neither index Flash well; XML Sitemaps are a universal standard that should be taken advantage of; the local indexes are easy to submit to; and both have Sitelinks but only Google allows you to edit them. Differences between the two search engines: there's not a formalized process for getting into Bing News results and Google's shopping vertical is free to publishers while Bing's is a paid service. Bing's program manager said that the functionality provided by Yahoo! Site Explorer will still be available. It's not their intention to alienate SEOs because they consider SEOs users, too. The Bing Webmaster team has built a new Webmaster Tools platform from the ground up. It is scheduled to go live Summer 2010. The platform focuses on three key areas: crawl, index and traffic. Data in each area will go back through a six month period. Tree control is a new feature that provides a visual way to traverse the crawl and index details of a site. The rich visualizations are powered by Silverlight. URL submission and URL blocking will be available in the new Webmaster Tools. Nearly half of online search has a location intent, especially on mobile devices. Location services have a $20 billion potential according to Wall Street Journal. The SEO options for location based services are GetListed, microformats, Google, Yelp, Bing, and so on. To make money from location services, consider Google/AdMob, iAd and MillennialMedia. Location-based services are about rewarding loyalty. The key is to get in early. $12 billion dollars is the expected worth of location-based services in 2014. Local continues to gain more steam. On Google, 20-40 percent of search queries are location-based. A multifaceted link building process by Roger Montti: target sites; troll for sponsor or ad opportunities; join and get links from membership associations; recognize the risks of paid links; fix broken links; and be a guest blogger or article writer. A multifaceted link building process by Arnie Kuenn: be creative and funny; send out targeted e-mail requests; and use content development and social media promotion. A multifaceted link building process by Debra Mastaler: syndicate content, including podcasts and user generated content (UGC); distribute media releases; write guest blog posts; create widgets; and develop microsites. Infographics are great link magnets because they visualize otherwise boring data, making it sharable in the social sphere. Tools to get your message out: HelpaReporter, PitchEngine, Social Mention, ScoutLabs. Customer and user insight tools: Rapleaf, Flowtown. Tools to find influencers: Klout. Forum tools: Bing Boards, Omgili, Board Tracker, Board Reader. Digg tools: Digg Alerter, FriendStatistics, di66.net. Make use of the social tools offered by social networks, e.g. utilize Facebook's many options to update your page and communicate your fans by SMS. Encourage people to follow you using Twitter's short code. In the contract, communicate what it is you'll be doing for the client. Start with an overview paragraph, and then go into details — give bullet points with one or two sentences for each task point that will be delivered. Pay for performance services should be chosen carefully based on criteria including: the client has a lot of potential and the client's site has site architecture issues that would greatly benefit from being resolved. Consider including a waiver of warranties and limit of liabilities in the contract. This basically says you're not responsible for any more than the client paid you. Sharing links on Twitter can get you links because even though they're nofollowed on Twitter, they're not always "nofollowed" in widgets or reshares. Create a synergy with your social media campaigns by focusing on community and communication and by leveraging assets like data for other online marketing channels. Real-time search is about author quality, site authority/trust and relevancy, freshness, number of followers, quality of followers, ratio of followers compared to number followed, and URL real-time resolution. Relevancy is becoming more important that recency, with relevant results getting more hang-time in results. There are 436 million searches per month on Facebook. People search is still the predominant use of Facebook search, but an increasing number of users are searching for brands. When targeting your ads, consider likes; location; demographics, including age and gender; "interested in;" language; and ad copy plus image. Images greatly improve click-through rate. The ranking factors for the Suggest box include friends with keywords in the name, any place you've been in Facebook, events you're invited to, events your friends are attending, pages or interest you like, and anything else your friends like. Marketers are seeing most success on Facebook with brand awareness, preference, loyalty, advocacy and internal morale and culture. Link your Google Analytics and AdWords account, which will provide you additional reports that can provide critical insights to allow fine tuning of your PPC campaigns. It also helps you define custom reports. You can look at optimization from two perspectives: pre-visit optimization and post-visit optimization. If there's a problem getting conversions from clicks, consider that the problem might be the marketing and not delivering what the user expected. One way to assess the likelihood of conversion for your campaign is to evaluate if it's READY: relevant, engaging, authoritative, directional and yield optimal. Attribution should consider first click, linear allocation, decaying allocation, reverse decay allocation, and U-shaped allocation. These are all ways to map the multi-touch point of a user from initial contact to final conversion, then assigning weight either earlier on in the process, closer to the middle, later on, or some other mix. Understand the points of contact and whether they have value other than conversion — the consumer experience and how you can influence them along the way. Consider: awareness and branding, consideration, conversion and retention. As people become more diversified with their online experience, an ideal answer for attribution modeling has not yet been developed. However, you track it down to the user experience, which Omniture allows. Creating an attribution model for your business can be really challenging, so start simple and evolve from there. Doing something is better than waiting until you can do everything. When optimizing site architecture, prioritize issues of speed and performance, long-tail content, duplicate content, video sitemaps and microformats accordingly. Increase Googlebot visits by: strengthening indexing signals like uniqueness and freshness, use proper response codes, be interpretable with standard encodings, serve content reliably and prevent crawling of unnecessary content. Use faceted navigation, which is great for users but is a pain for bots. For bots, rewrite facets to pretty URLs based on priority, place faceted experience in a folder for more control, and append "overhead" attributes to the pretty URLs; rel="canonical" back. So You Want to Test SEO? Data points to consider in SEO testing: channel, keyword groups, keyword, and entry page. Test the impact of SEO elements on your conversion. When you make a change, see if there's a negative impact on conversions. If there isn't, you're safe to move ahead. When testing keyword choice, don't use either extreme of nonsense terms or highly competitive results; instead, use slightly competitive keyword terms. Statistical analysis is very difficult, so avoid confusing correlation with causation and consult a professional.